The cooler it gets, the more layers we can wear to protect our food babies from judgy eyes. Ready to work on your winter body? We sure are, and with the help of new Tex-Mex hotspots and all the Italian you can handle, we’ll be thicc in no time. Here’s to enjoying good food. The Dalgety Public House had some private time to undergo a full refurb! Flaunting its new face from April 4, eager diners can expect to kick back in the fresh gastro pub complete with an entirely new sports bar downstairs. Besides a slick look, the overhauled menu now features the likes of katsu sando and pork belly with watermelon, with a dedicated margarita menu set to shake things up. This is a very fine house. Everyone is itching for the opening of InterContinental Hayman Island (July 1, friends), and will be even more so after hearing the goss on what eats will be up and cooking. The lush resort will offer five dining destinations, dubbed Pacific (gourmet brekkie and a la carte dinners), Aqua (poolside eatery slinging seafood and cocktails), Amici Trattoria (hearty Italian eats), Bam Bam (pan-Asian/Aussie eats) and Bar Fifty (cocktails, canapés and bites). Rest assured we’ll be working our way through all of them. April 3, come at me. Death & Taxes is opening its doors to a 1920s speakeasy-style lounge tomorrow, letting Brisbane in on crafty cocktails, wines and Champagne for cheeky catch-ups done right. Long live Death & Taxes. Byron Bay is making way for El Camino Cantina! The popular Tex-Mex chain is getting beach chic at new dining, retail and entertainment precinct Mercato on Byron, with frozen margs and burritos adding a bit more flavour to the foodie scene. Looks like we’ll be paying a sneaky g’day to the Bay v. soon. Howard Smith Wharves just keeps getting better, with new Italian restaurant Polpetta popping up at Brisbane’s latest Art Series venue, The Fantauzzo. Breakfast, lunch and dinner will see the likes of fava bean, pea, mint and buffalo ricotta bruschetta, grilled octopus, and housemade pasta hit your plate, making for another must-do on your new eatery hitlist. If you’re making tracks for Port Douglas, hit up Sheraton Grand Mirage Resort’s Daintree Bar in all its revamped glory. Officially re-launching next week, Daintree Bar will feature artisan spirits tasting boards, private nooks and large group tables. You had us at tasting boards. 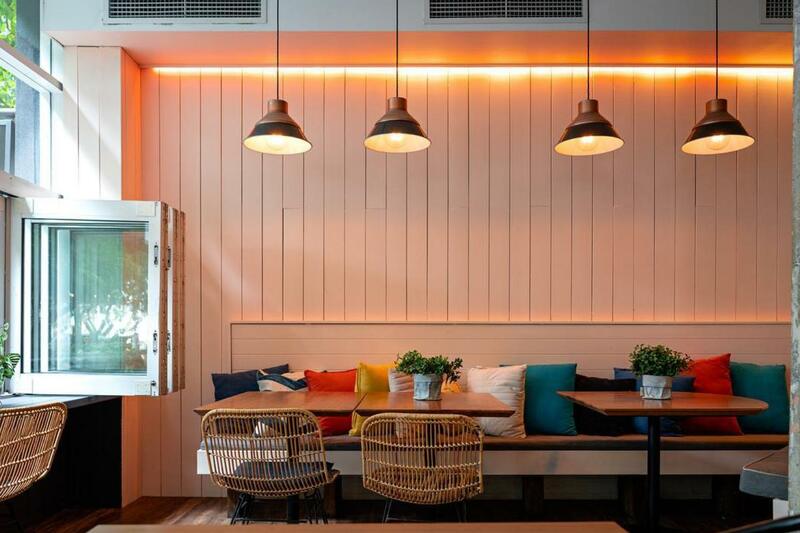 Easy, cheesy, chatty, Salon de Co. Ovolo Incholm’s signature restaurant is hosting Cheese & Chats from 6pm on April 11, where a glass of prosecco on arrival will set you up for a night of wins. Chef Andy Ashby and the Salon de Co crew are teaming up with Tom Merkli from Cheese Culture to showcase a selection of the hottest Australian and international cheeses of the season. In between tasting boards and three cheese-focussed dishes with perfectly paired wine or beer, you’ll be learning the ins and outs of cheese, glorious cheese – who doesn’t want more fun facts to whip out at your next dinner party? Find out more and book your spot here.